Are cryptocurrencies money or currency? In Hong Kong and throughout the world, financial technology (FinTech) is transforming traditional financial services. The most promising technology is Blockchain, which is a distributed ledger technology, which provides a new mechanism for recording and verifying information. Blockchain is the technology which underlines the relatively new phenomena of cryptocurrency. In January 2009, Bitcoin, the first cryptocurrency based on Blockchain technology, was issued. Bitcoin is a digital payment system which facilitates electronic payments without the need for an intermediary, such as a bank, for settlement. In the beginning, Bitcoin was traded by only a few tech enthusiasts. The first purchase of a good with Bitcoin occurred in 2010 when a user transacted 10,000 bitcoins for two pizzas. It has since largely become a speculative commodity. Bitcoin has grown to a market capitalisation of over 70 billion USD, with a circulating supply of over 16 million bitcoins. Over one thousand other cryptocurrencies, known as “altcoins”, have been released since Bitcoin. The second largest cryptocurrency by market capitalisation after Bitcoin, Ethereum, was released in 2015. There has been an exponential growth in cryptocurrencies over the past one to two years. The market capitalisation of cryptocurrencies has grown from around USD 4 billion in September 2015 to USD 12 billion in September 2016. The current market capitalisation of all cryptocurrencies exceeds USD 150 billion. The market dominance of Bitcoin has rapidly decreased since the beginning of March this year, especially with the increasing dominance of Ethereum. Bitcoin has historically accounted for over 80% or 90% of market capitalisation of all cryptocurrencies, but as of September 2017, it constitutes just less than 50% of the market. The operation of Bitcoin, as with other cryptocurrencies, is dependent on Blockchain technology, which is an ‘open distributed ledger’ which records transactions between parties in an efficient, verifiable and permanent way. The advantage of Blockchain technology is that the records of transactions are in a digital format, and are “stored in transparent, shared databases, where they are protected from deletion, tampering, and revision”. The business model of Bitcoins depends on a system whereby Bitcoins are created by mining, and that the number of Bitcoins that may be issued is limited to 20 million. The value of Bitcoins has increased at a phenomenal rate suggesting that there is a huge speculative appetite for cryptocurrencies. However, Bitcoins are not widely accepted as a medium of exchange, so it is highly unlikely that they will replace fiat currencies. The potential of digital coins or tokens as a new mechanism for raising funds from the public has been seen with the large number of Initial Coin Offerings (ICOs) which have raised more than USD 2 billion since 2013. 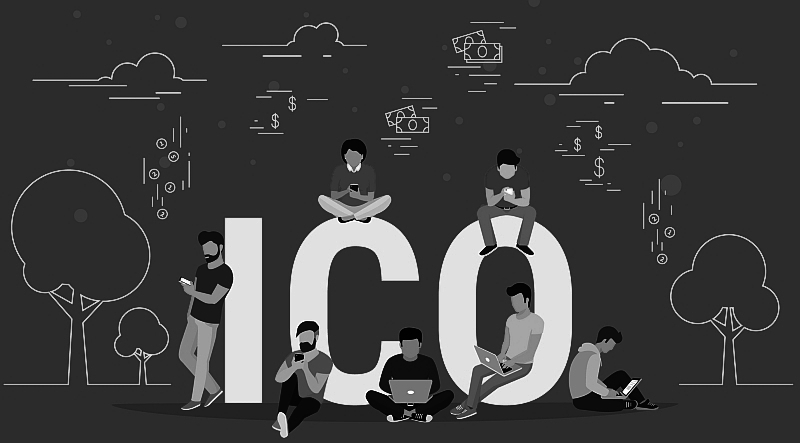 ICOs are a method of crowdfunding for a cryptocurrency platform, whereby investors are offered newly-issued cryptocurrency coins in exchange for other cryptocurrencies or fiat currencies. However, as The Economist has pointed out, ICOs is a somewhat misleading term in that it sounds like Initial Public Offerings (IPOs), but they are very different in that investors in ICOs do not receive ownership rights but instead receive a token issued on a Blockchain, the value of which is highly questionable. Further, in contrast to IPOs, ICOs are not subject to a system of regulation, for example there are few meaningful disclosures to assist potential investors in ICOs. Rather there is a glossy white paper accompanying an ICO which include a series of unverifiable claims. An underlying challenge with ICOs is that there is little clarity in how the current system of regulation applies to ICOs. There are difficult legal issues such as the potential application of currency and monetary laws, payment system laws, securities and commodities laws, and anti-money laundering laws. While other jurisdictions have introduced specific legislation and/or regulation governing cryptocurrency activities, such as the Virtual Currency Act in Japan and the New York State Department of Financial Services’ regulations on virtual currencies, Hong Kong has not yet followed suit. ICO start-ups work in an uncertain legal environment. Most jurisdictions have not enacted legislation or regulation governing cryptocurrency. Current legislation and regulation have not been drafted with cryptocurrency in mind. Thus, it is necessary to determine the legal position of cryptocurrency in the existing legislative and regulatory framework. There is no legal certainty as to whether cryptocurrencies are securities and thus subject to securities regulation. Several regulatory bodies including in Singapore, the US, the UK and Hong Kong, have issued statements that cryptocurrencies may constitute securities, but have pointed out that whether a cryptocurrency is a security is determined on a case-by-case basis. Recently, there has been a sudden exponential growth in cryptocurrency. In response, regulators in the US, the UK, Russia, the PRC and Hong Kong have taken a more sceptical, if not hostile, view of the legitimacy of ICOs. There is general concern regarding the risks associated with cryptocurrencies, including AML/CTF risks and fraud. In order to ensure that issuers and participants do not fall foul of the legal requirements and expectations of regulators and law enforcement, it is necessary that appropriate legal advice is obtained to protect the legal position of the issuer and any other participant in an ICO. Appropriate disclosures and disclaimers should be considered when issuing documents concerning ICOs. When providing advice, a number of key legal/regulatory questions in relation to ICOs should be addressed. The issues include whether cryptocurrencies constitute “securities” the offering and sale of which is subject to securities laws. Over the last few months, a number of regulators have issued statements that digital tokens which have the characteristics of typical securities (e.g. shares, debt and other investment products) will be regulated irrespective of the name ascribed to them. The first significant announcement concerning ICOs was issued by the United States Securities and Exchange Commission (SEC). In July 2017, the SEC issued an investigative report in which it determined that “DAO Tokens” offered and sold by a “virtual” organisation called the DAO were “securities” under the Securities Act of 1933 and the Securities Exchange Act of 1934. DAO Tokens were offered in exchange for Ether (ETH) and the ETH raised would be used to fund projects. DAO Token holders stood to share in the expected profits from these projects as a return on their investment in DAO Tokens. Under US securities law, a security includes an “investment contract”, which is an investment of money in a common enterprise with a reasonable expectation of profits to be derived from the entrepreneurial or managerial efforts of others. “an investment of money”Investors in The DAO used ETH to make their investments. The investment of “money” does not need to take the form of cash, and investment may take the form of goods and services, or some other exchange of value. It had previously been held that an investment of Bitcoin meets this first prong. “in a common enterprise with a reasonable expectation of profits”Investors were investing in a common enterprise and reasonably expected to earn profits through that enterprise when they sent ETH to The DAO’s Ethereum Blockchain address in exchange for DAO Tokens. Profits include “dividends, other periodic payments, or the increased value of the investment”. Investors were informed through promotional materials distributed by Slock.it (the platform’s creator) and its co-founders that The DAO was a for-profit entity whose objective was to fund projects in exchange for a return on investment. Depending on the terms of each specific project, DAO Token holders stood to share in the potential earnings from the projects the DAO funded. Therefore, a reasonable investor would have been motivated, at least in part, by the prospect of profits on their investment in The DAO. The Efforts of Slock.it, Slock.it’s Co-Founders, and The DAO’s Curators Were Essential to the EnterpriseThe DAO’s investors relied on the efforts of Slock.it & its co-founders and Curators to manage The DAO and put forth project proposals. The issue is whether their efforts are “undeniably significant ones, those essential managerial efforts which affect the failure or success of the enterprise”. Investors’ expectations were primed by the marketing of The DAO as well as the active engagement between Slock.it and its co-founders with The DAO and DAO Token holders (via the DAO website and online forums). The creators of The DAO held themselves out to be experts in Ethereum, and informed investors that Curators were chosen based on their expertise and credentials. Through their conduct and marketing materials, Slock.it and its co-founders led investors to believe that they could be relied on to provide the significant managerial efforts necessary to make The DAO a success. Curators vetted Contractors who submitted proposals, determined whether and when to submit proposals for votes, determined the order and frequency of proposals submitted for vote, and determined whether to halve the default quorum for a successful vote for specific proposals. Thus, proposals were subject to control by the Curators, and the Curators exercised significant control over the order and frequency of proposals. DAO Token Holders’ Voting Rights Were LimitedVoting rights did not provide token holders with meaningful control over the enterprise. Their ability to vote was largely perfunctory, and there are indications that proposals would not have necessarily provided investors with sufficient information to make an informed decision. In addition, the pseudonymity and dispersion of token holders rendered it difficult for holders to join together to effect change or to exercise meaningful control. DAO token holders’ voting rights were akin to those of a corporate shareholder. DAO Token holders relied on the significant managerial efforts of Slock.it and its co-founders, and The DAO’s Curators. Their efforts were the “undeniably significant” and essential to the overall success and profitability of any investment into The DAO. The SEC stated that whether a particular transaction involves the offer and sale of a security will depend on the facts and circumstances, including the economic realities of the transaction. By far the most stringent response to ICOs to date is that of the People’s Bank of China which together with 6 other financial regulators in the PRC issued a circular on 4 September 2017 banning ICOs in the PRC. In the circular, ICOs are declared to be an unauthorized illegal fundraising activity. The circular also prohibits digital tokens from being circulated as a currency in the market. The circular states that ICOs are not issued by monetary authorities, do not have legal and monetary properties such as indemnity and coercion, and do not have legal status equivalent to that of money. From the date of the circular, all ICOs are required to cease immediately. Money already raised through ICOs must be refunded to investors. Digital token financing and trading platforms are prohibited from engaging in the exchange of fiat currency and virtual currency; buying and selling virtual currencies; and providing pricing, information and intermediary services in relation to virtual currencies. Financial institutions and non-banking payment institutions are prohibited from, directly or indirectly, providing services or products relating to ICOs, such as setting up accounts, registration, trading, settlement, clearing and insurance. In August 2017, the Monetary Authority of Singapore (MAS) issued a media release clarifying that the offer or issue of digital tokens in Singapore will be regulated if the tokens constitute products regulated under the Securities and Futures Act (Cap. 289) (SFA). MAS also noted that ICOs are susceptible to AML/CTF risks given their anonymous nature, as well as the ease with which considerable amounts of money can be raised over a short period. MAS is in the process of evaluating how to regulate AML/CTF risks in relation to digital tokens that do not function purely as virtual currencies. MAS noted that the function of digital tokens has developed beyond solely being a virtual currency. For example, digital tokens may represent ownership or a security interest over an issuer’s assets or property, and thus may constitute an offer of shares or units in a collective investment scheme pursuant to the SFA. Another example is that digital tokens may represent a debt owed by an issuer, and therefore be regarded as a debenture under the SFA. Where digital tokens fall within the definition of securities under the SFA, issuers would be subject to prospectus requirements (unless exempted), and issuers and intermediaries would also be subject to SFA and Financial Advisers Act (Cap. 110) licensing requirements (unless exempted) as well as AML/CTF requirements. In June 2017, it was reported that according to the Deputy Governor of the Central Bank of the Russian Federation, Olga Skorobogatova, the central bank intends to introduce its own national cryptocurrency. On 4 September 2017, the Bank of Russia released a statement in which in warned of the high risks associated with cryptocurrency and stated that it considers it premature to admit cryptocurrencies for trading in Russia. On 8 September 2017, Russia’s Finance Minister Anton Siluanov, stated at the Moscow Financial Forum that the finance ministry will regulate cryptocurrencies in Russia by the end of 2017. According to Siluanov, instead of banning cryptocurrencies, the purchase of cryptocurrencies should be treated in a manner similar to the acquisition of securities. On 12 September 2017, the UK’s Financial Conduct Authority (FCA) released a statement on ICOs, warning consumers that ICOs are “very high-risk, speculative investments”. The FCA cautioned that persons should only invest in an ICO if they are experienced investors, confident in the quality of the ICO project and are prepared to lose their entire stake. The FCA warned of risks associated with ICOs, including that most ICOs are not regulated by the FCA, the lack of investor protection, price volatility, the potential for fraud, and that most are in a very early stage of development. Further, ICOs are not subject to regulated prospectus requirements, but rather a ‘white paper’ is usually issued, which may be unbalanced, incomplete or misleading. Whether ICOs are regulated by the FCA is determined on a case-by-case basis, and depends on how the ICO is structured. The FCA warned businesses that they should carefully consider if their activities could constitute arranging, dealing or advising on regulated financial investments. A key issue surrounding cryptocurrencies is whether they are regarded as securities and thus subject to an extensive regulatory regime. On 5 September 2017, Hong Kong’s Securities and Futures Commission (SFC) issued a statement on ICOs (SFC Statement). According to the SFC Statement, whilst digital tokens offered in typical ICOs are usually characterised as a “virtual commodity”, depending on the facts and circumstances of an ICO, digital tokens that are offered or sold may be “securities” as defined in the Securities and Futures Ordinance (Cap. 571) (SFO), and subject to the securities laws of Hong Kong. “Securities” are broadly defined under the SFO. The SFC also has a right to prescribe a class of interests, rights or property as a security by notice. Whether digital tokens of an ICO are considered to be securities under the SFO is a complex legal issue. There are a number of relevant considerations in determining whether the digital tokens are securities, such as the terms of the issue of the token, including its characteristics, as well as the underlying platform and business model, such as whether the tokens are being used to fund a project, to facilitate a payment system or as a vehicle for trading cryptocurrency on an exchange. The SFC Statement outlines three types of offerings in which digital tokens might constitute “securities”, namely where the digital tokens are regarded as shares, debentures, or interests in a collective investment scheme (CIS). SharesAccording to the SFC Statement, digital tokens offered in an ICO may be regarded as “shares” where they represent equity or ownership interests in a corporation, for example where token holders are given shareholders’ rights, such as the right to receive dividends and the right to participate in the distribution of the corporation’s surplus assets upon winding up. DebenturesWhere digital tokens are used to create or acknowledge a debt or liability owed by the token issuer, the SFC may regard them as “debentures”, for example where an issuer may repay token holders the principal of their investment on a fixed date or upon redemption, with interest paid to token holders. Interests in a CISThe SFC Statement provides that if token proceeds are managed collectively by the ICO scheme operator to invest in projects with an aim to enable token holders to participate in a share of the returns provided by the project, the digital tokens may be regarded as interests in a CIS. The SFC Statement provides that if token proceeds are managed collectively by the ICO scheme operator to invest in projects with an aim to enable token holders to participate in a share of the returns provided by the project, the digital tokens may be regarded as interests in a CIS. the purpose of the arrangement is to provide participants with profits, income or other returns from the acquisition or management of the property. There have been no court decisions on the meaning of “collective investment scheme” in Hong Kong, and whether or not any particular ICO falls within the definition will depend on the facts and circumstances of the ICO and ultimately, the courts’ interpretation of the statutory definition. In Hong Kong, as in the US and other jurisdictions, ICOs are typically being structured so that the digital tokens will represent a right of access to the technology whose development the ICO proceeds will fund. The intention behind this is to characterise the tokens as pre-payment vouchers rather than as securities. White papers thus typically present the digital tokens as providing purchasers with the right to use the technology and they sometimes additionally act as the means of payment for use of the services offered by the technology. Dealing in or advising on digital tokens regarded as “securities” under the SFO, or managing or marketing a fund investing in such digital tokens may constitute a “regulated activity”. Parties engaging in a “regulated activity” must obtain a licence from the SFC where their activities target the Hong Kong public, regardless of whether the parties are located in Hong Kong. There is a limited exemption from the requirement to be licensed to deal in securities where a person, as principal, deals with a person who is a “Type 1 professional investor”. This includes licensed investment intermediaries, authorised financial institutions, regulated insurance companies, regulated collective investment schemes, government and multilateral agencies. investment companies owned by an individual, corporation or partnership who qualify as professional investors where the investment company’s sole business is to hold investments. ICOs involving an offer to the public to participate in a CIS require SFC authorisation, unless an exemption is available, including a professional investor exemption. Another major issue is whether cryptocurrencies are regarded as money or currency which has important implications because many laws refer to money, such as various licensing regimes and the criminal law. In March 2015, the Secretary for Financial Services and the Treasury of the Hong Kong Government (FSTB) stated in the Hong Kong Legislative Council that Bitcoin and other kinds of virtual commodities do not qualify as e-currencies, having regard to their nature and circulation in Hong Kong at that time. The Secretary further stated that the Hong Kong Government did not consider it necessary to introduce at that moment new legislation to regulate trading in such virtual commodities or prohibit people from participating in such activities. The Hong Kong Monetary Authority (HKMA) has also stated that it regards Bitcoin not as legal tender but as a “virtual commodity”. According to its February 2015 press release, “As Bitcoin does not have any backing – either in physical form or from the issuer – and its pricing is highly volatile, it does not qualify as a means of payment or electronic money. Bitcoin and other similar virtual commodities are not regulated by the HKMA”. In its statement, the HKMA also reminded the public of the risks involved in Bitcoin trading, and that cases have been reported to the police which may involve fraud or pyramid schemes. Under the Payment Systems and Stored Value Facilities Ordinance (Cap. 584) (PSSVFO), the HKMA may, by notice published in the Gazette, declare a thing to be a medium of exchange for the purposes of this Ordinance. This may potentially include Bitcoin or another cryptocurrency. There may be implications where a cryptocurrency platform is being used as a medium for payments. If a cryptocurrency is declared a medium of exchange, there may be implications as to whether the relevant platform is a stored value facility (SVF) or designated by the HKMA as a retail payment system (RPS) or a clearing and settlement system under the PSSVFO. A significant issue is whether legal persons are subject to the comprehensive requirements under AML/CTF laws, such as know your client and reporting obligations. Hong Kong’s financial regulators, including the SFC and the HKMA, have required financial institutions to assess stringently money laundering and terrorist financing risks associated with virtual commodities in accordance with the Anti-Money Laundering and Counter-Terrorist Financing (Financial Institutions) Ordinance (Cap. 615) (AMLO). In January 2014, the SFC issued a circular reminding licensed corporations (LCs) and associated entities (AEs) to take all reasonable measures to ensure that proper safeguards exist to mitigate the AML/CTF risks that they may face. Virtual commodities that are transacted or held on an anonymous basis inherently present significantly higher AML/CTF risks. The SFC in its September 2017 statement, cautioned investors that they may be exposed to increased risks of fraud, given that these arrangements and the parties involved operate online and may not be regulated. The difficult issue in classifying digital tokens is the fact that even if tokens’ primary purpose is to provide access to new technology, they are undoubtedly being traded by speculators for the purpose of profit taking. Whether that alone should bring a token within the definition of “securities” is arguable. Legally, token offers are very much like so-called pre-sale or reward-based crowd-funding, e.g. the type of projects that appear on Kickstarter and Indiego. Members of the public can fund the development of a particular project – e.g. the manufacture of a watch or the building of a gym in return for the right to receive the watch or use the gym once the watch is produced or the gym is built. Funders of the project have the right to sell the watch or gym membership at a profit: but neither would be regarded as constituting “securities”. Arguably therefore a token which creates a right to use technology once it is developed, which may or may not be sold at a profit, should be treated in the same way. There are clearly risks associated with ICOs – the project may never be completed and token holders stand to lose their investment. Tokens would not in most cases give holders any contractual rights against the token issuer or any rights on its insolvency. Offers are not generally restricted to professionals deemed sufficiently sophisticated to assess the risks of investment. The disclosure made in white papers is not subject to any particular standards or scrutiny. Whether regulators choose to clamp down on token offers will probably depend on the perceived risk to retail investors. There are clearly arguments both for and against the regulation of ICOs. While greater legal certainty would be welcome, there have been calls to ensure that any regulation imposed should not be overly onerous. Many, although not all, ICOs are involved in the development of Blockchain-based technology which will offer substantial improvements in efficiency. The danger of over-regulation is that technological innovation may be stifled. This summary is for general information purposes only. Charltons advises on Hong Kong law and is not qualified to advise on the laws of any other jurisdictions, including without limitation, the US, England and Wales, PRC, Singapore and Russia. The above information is based on Charltons’ general understanding of the position only. Specific legal advice should be sought from lawyers practising in each relevant jurisdiction in relation to the facts and circumstances of any specific situation. (page accessed 12 September 2017). CoinMarketCap, “CryptoCurrency Market Capitalizations – All CryptoCurrencies” (page accessed 12 September 2017). CoinMarketCap, “CryptoCurrency Market Capitalizations – Global Charts” (page accessed 12 September 2017). CoinMarketCap, “CryptoCurrency Market Capitalizations” (page accessed 12 September 2017). The Economist, “What are initial coin offerings”, 22 August 2017 . Reuters, “Russia to regulate Bitcoin market: finance minister”, 8 September 2017 .